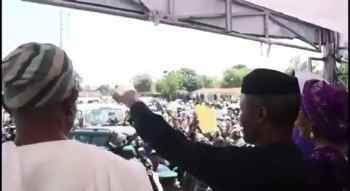 VP Yemi Osinbajo In Iwo, Osun State for the launching of the Trader Moni Scheme, a Federal Government Enterprise and Empowerment program for Petty traders. With HE Gov Rauf Aregbesola, his deputy, HE Mrs. Titilayo Laoye Tomori and the Oluwo of lwo, Oba Akanbi. In Iwo, Osun State for the launching of the Trader Moni Scheme, a Federal Government Enterprise and Empowerment program for Petty traders. With HE Gov Rauf Aregbesola, his deputy, HE Mrs. Titilayo Laoye Tomori and the Oluwo of Iwo, Oba Akanbi.